Very convenient, as it may be made several hours before it is baked, or when a nice addition is wanted unexpectedly. Pare and chop fine a half a dozen or more, according to their size, of the best cooking apples; grease a pudding-dish, cover the bottom and sides half an inch thick with grated bread and very small lumps of butter; then put a layer of apples with sugar and nutmeg, and repeat the layer, which must be of bread and butter; pour over the whole a teacup of cold water. Put into the oven as soon as the dinner is served, and bake it twenty-five or thirty minutes. It may be baked the day before it is wanted; when it must be heated thoroughly, turned into a shallow dish, and sprinkled with powdered sugar. It requires no sauce. Image: John Singleton Copley. 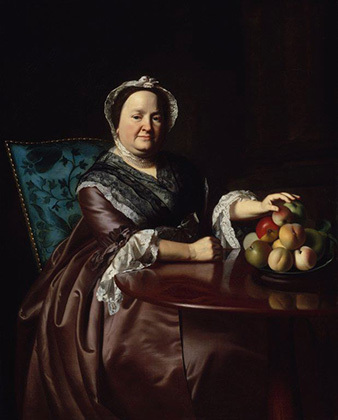 Portrait of Mrs. Ezekiel Goldthwait (Elizabeth Lewis), 1771. Museum of Fine Arts, Boston. Bequest of John T. Bowen in memory of Eliza M. Bowen.